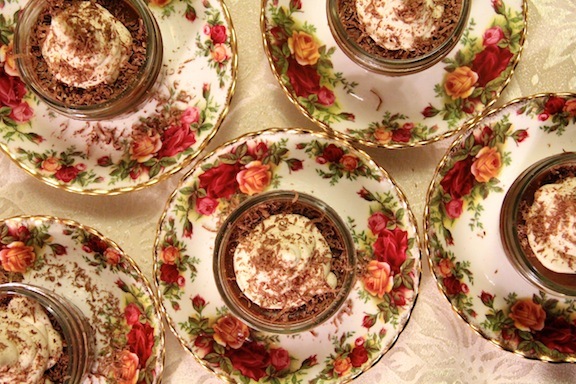 Hey, Lady Grey: Two decadent chocolate recipes, just in time for Valentine's Day…. 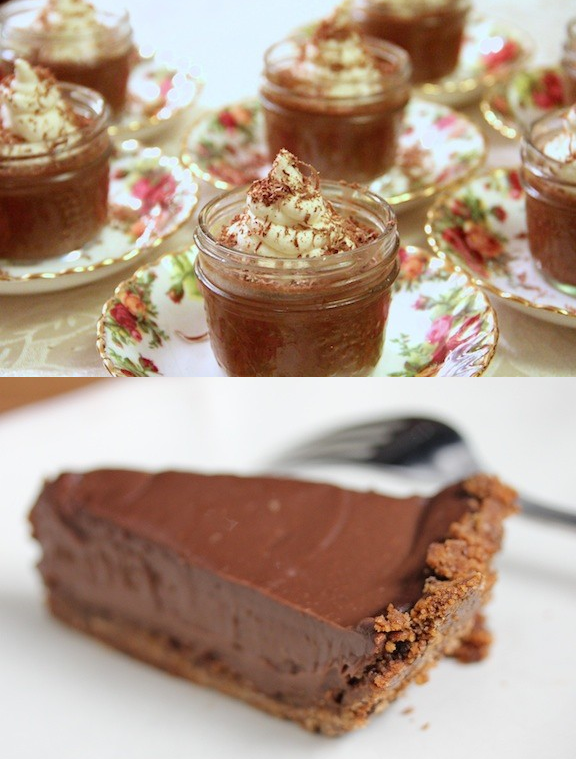 Two decadent chocolate recipes, just in time for Valentine's Day…. I've been meaning to post both of these recipes for months now. And what better time than Valentine's for some intense, deeply satisfying chocolate goodness?! 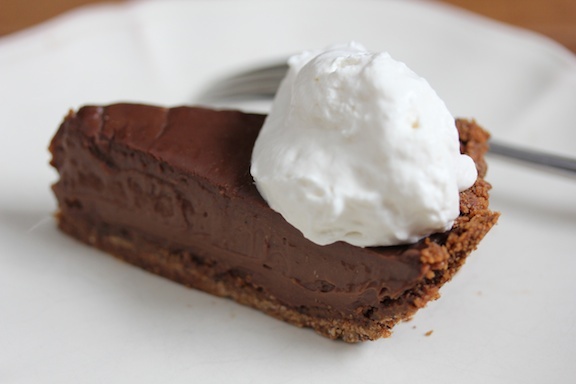 The first recipe is a Chocolate Cream Pie made with an equally chocolatey graham cracker crust. I made this for some friends last month, and let's just say there were a lot of moans and "oohs" and "ahhs" going around the table, and no leftovers at all. 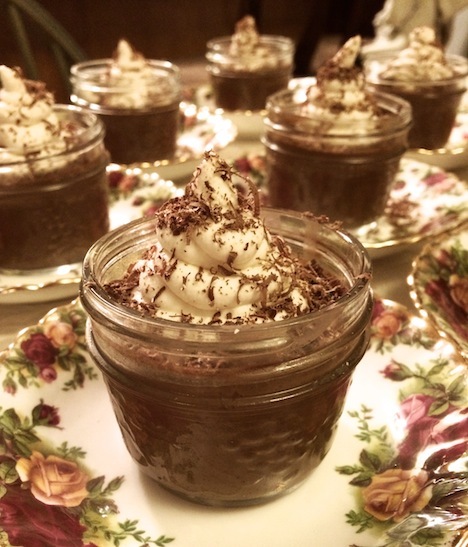 The second recipe is for Orange-Chocolate Pots de Creme with cinnamon. I have made this recipe two years in a row for Christmas because it is SO easy and can be made in advance. And it is to-die-for!! It's rich, and luxurious, and, dare I say, sensual?! I never used to be a fan of orange-chocolate until I met my husband, who adores it. This recipe has me converted. Ok enough said. Read on for the details…. Preheat oven to 350 degrees F (set oven rack to middle position). Grease a 9-inch pie plate with butter and set aside. For the crust: In a large bowl mix the crumbs, butter, sugar, salt and chocolate. Press into the pie plate and up the sides to form an even crust. Chill for at least 20 minutes. Then bake (on a baking sheet) until slightly browned (18 minutes). Allow to cool on a wire rack. For the filling: In a bowl, whisk together the yolks, about half of the sugar, the cornstarch, and 1/2 cup of the milk. In a saucepan combine the remaining sugar, remaining 2 1/2 cups milk, the cocoa, chocolate, vanilla and salt. Bring to a simmer. Whisking constantly, gradually pour the hot milk into the egg mixture to temper it. Set a strainer over the saucepan and strain the custard back into the saucepan. Bring to a boil over medium heat while whisking constantly. Boil for 10 seconds - the mixture should be thick like pudding. Transfer the custard to the bowl of a stand mixer (or any mixing bowl) and beat on medium speed (using paddle attachment) for 2-3 minutes, to cool slightly. Then beat in the butter, bit by bit. Pour the custard into the pie shell and smooth out the top. Refrigerate until very cold (2-3 hours). Serve pie slices topped with a dollop of whipped cream (or spread a layer of whipped cream over the entire pie and then refrigerate until ready to serve). Bring cream, milk and cinnamon tho a simmer in a saucepan. Remove from heat and stir in the chopped chocolate until melted. Whisk together yolks, sugar, and a pinch of salt. Then, very slowly at first, whisk in the melted chocolate mixture (whisking constantly). Strain mixture through a sieve into a bowl, and allow to cool to room temperature (stirring occasionally). Preheat oven to 300 degrees F. Line a roasting pan with a kitchen towel and place ramekins (or small mason jars) on the towel. Divide the custard between the ramekins, then add enough water to the pan to reach halfway up the outsides of the ramekins. Cover pan with aluminum foil (poke a few holes in it to all steam to escape), and bake until custards are set but ever-so-slightly still wobbly in the middle (about 30 mins). Transfer the custards to a rack to cool, about 1 hour. They will continue to set as they cool. Then chill (covered) for at least 3 hours. These are great to make ahead (up to 48 hours) to save time.